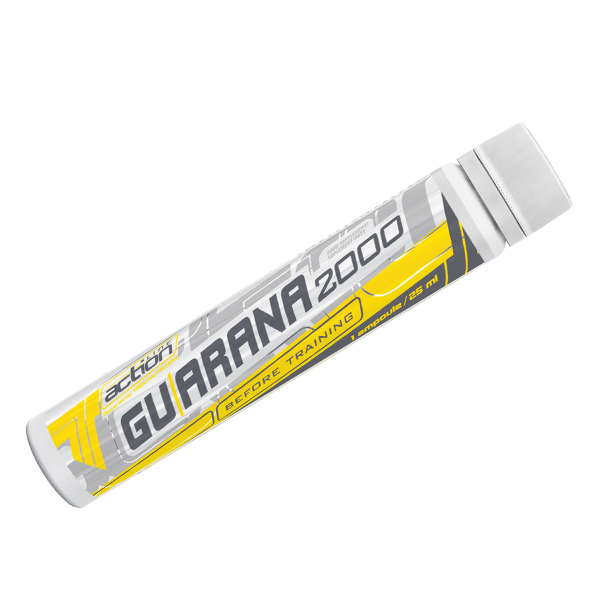 GUARANA 2000 contains extract of Brazilian Guarana, which is a rich source of slowly released caffeine. The product is recommended to physically and professionally active persons, intended for use before tasks requiring high physical and mental capacity. Recommended daily portion is 25 ml (1 ampoule). Take a single serving of the product ‒ 12,5 ml (0,5 ampoule - 1 tablespoon) two times daily, preferably 30 min. before a meal or a workout. Please note: Do not take before bedtime! Do not use more than 3 months. Shake before use. The product can be dissolved in water. WARNINGS: Do not exceed the recommended daily dose. Do not use the product as a substitute for a varied diet. Children, pregnant or nursing woman must not take the product. Do not use the product in case of circulatory system problems or sensitivity to caffeine. Do not combine with alcohol! Varied and balanced diet and a healthy lifestyle are important. STORAGE: Keep this packaging tightly closed in a dry place, at the temperature of 15–25°C. Keep out of the reach of children. Consume the product within 30 days after opening. BEST BEFORE END, BATCH NUMBER, COUNTRY OF ORIGIN: See lower part of the label. INGREDIENTS: water; saccharose; dextrose; guarana extract (Paullinia cupana) [10% caffeine] (8%); acidity regulator – citric acid; aroma; preservatives – potassium sorbate, sodium benzoate; thickeners – guar gum, xanthan gum; vit. B6 (pyridoxine hydrochloride).